BJJ is a Martial art of grappling. BJJ includes self defense, takedowns, throws, submissions, reversals, escapes and strategies to develop the student as a better Martial artist. Ranking systems are different across the world in Martial arts, and in BJJ. Different instructors monitor belt ranking based on techniques, sparring, testing and developing. Professor William Vandry has studied BJJ under all five Machado brothers, members of the Gracies and other BJJ black belts from Brazil. 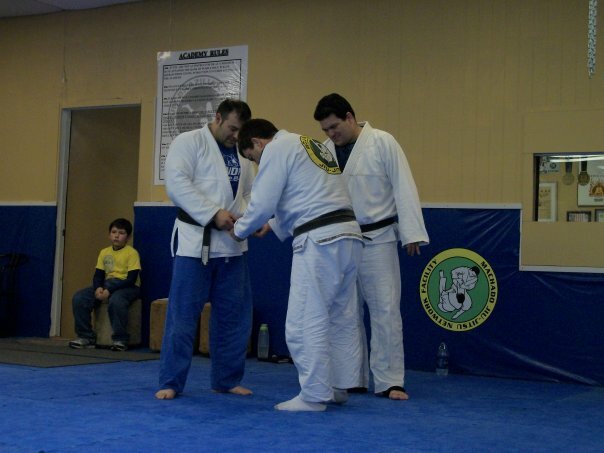 The inconsistent formatting of BJJ testing compelled Vandry to form his ranking structure, testing methods and specific techniques to better monitor the progress. Testing is generally made every two months. For Junior ranks or children and teen classes, the general belt system starts at white, then to gray, yellow, orange and green. Although not shown in the belt photos, Vandry also incorporates a system of testing for half white to half yellow, yellow to half yellow, half orange, orange to half orange, half green, and finally green belt for children and teens. Adults 18 and up begin with white belt to blue, to purple, to brown and then black belt. The chart below also shows black to 10th degree red belt. Black belt ranks are explained more below. The first black belt level is the black belt. There is no band, as in an older time and the origin of ranking black belts began with a basic black belt, red and white bands were added later to signify a black belt achieved assistant instructor to instructor level. The first and second degree black belts signify accomplishing study, material and understanding grappling, and explaining fundamental teaching of Jiu-jitsu. The third degree is 9 years of practicing Jiu-jitsu as a black belt. The development to teach fundamentals, intermediate and some advanced techniques are required. A third to sixth degree is a ‘Professor’ level, which is allowed to rank students up to black belt. Any level below 3rd degree ranking students without the authority of a 3rd degree or higher is illegitimate. This level is shown by the colors red and black on a belt. This is the Koral belt. Rolker Gracie – a prominent member of the Gracie family and the fourth son of Helio Graciel. Royler Gracie – Son of Helio Gracie who headed the Gracie Humaitá jiu-jitsu school in Rio de Janeiro. Carlos “Caique” Elias – One of only a handful of non-Gracies to receive a black belt directly from Hélio Gracie. Received his red-and-black belt from Rickson Gracie in March 2009. Former instructor at the original Gracie Humaitá and then at the Gracie Academy in California. Founder of the Caique Jiu Jitsu network of schools. Romero “Jacare” Cavalcanti – Founder and head coach of Alliance Jiu Jitsu team, one of only 6 people promoted to black belt by Rolls Gracie. Fábio Santos – Trained at Rolls Gracie Academy. Received Black Belt from Rickson Gracie and received Red and Black from Relson Gracie. 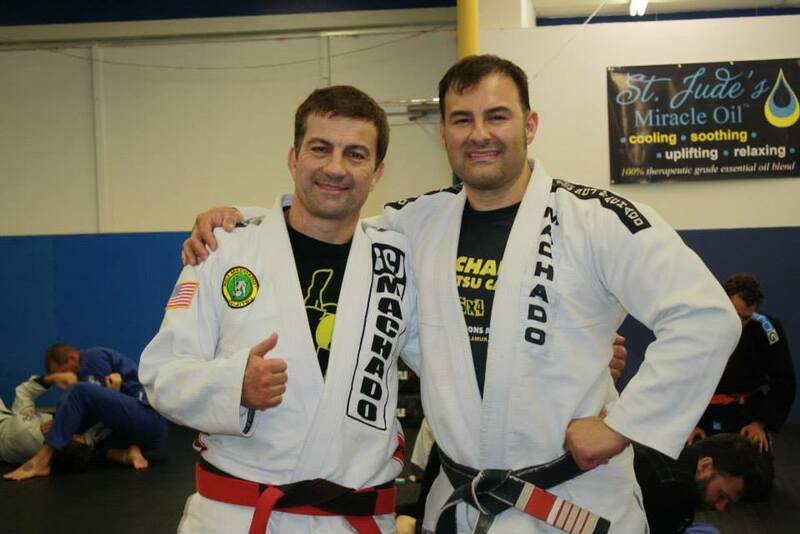 Mauricio Motta Gomes – One of only six Rolls Gracie black belts and father of multiple World Champion Roger Gracie. Luiz Fux – Current minister of the Supreme Federal Court. Fabricio Martins Costa – Black belt under Osvaldo Alves Head Instructor: Equipe – Fabricio JJ and Team Fabricio JJ ( Copacabana Brazil ). Awarded his coral-belt by Osvaldo Alves in 2012. Carlos Valente – Began training at 8 years old under Rolls Gracie. Received his black belt from Rickson Gracie and was awarded 7th degree from Robson Gracie in 2011. Marcio Stambowsky – “Macarrao” began training at age 15 under Rolls Gracie, becoming one of the Famous Five to earn a black belt under his tutelage. Carlos Gracie, Jr. – Founder of the International Brazilian Jiu-Jitsu Federation, the Confederation of Brazilian Jiu-Jitsu and Founder of the Brazilian Jiu-Jitsu Academy, Gracie Barra. Jean Jacques Machado – Captured every major title and competition award in Brazil, has appeared in several TV shows and movies. Awarded Coral belt by Rickson Gracie in 2011. Marcus Soares – Black belt under Carlson Gracie, and founder of Brazilian jiu-jitsu in Canada. Derval Luciano Rêgo (Mestre Morcego) – Founder of the FJJ-PE (Federação de Jiu-Jitsu do Estado de Pernambuco) and co-founder of the CBJJ/IBJJF. Black belt under the lineage of Oswaldo Fadda and Jacê Paulino de Albuquerque. Known for a draw match against the legendary Rolls Gracie at the end of the sixties in Rio de Janeiro. Arthur Virgílio Neto – Elected mayor of Manaus and former Federal Senator. Pedro Hemeterio – The first student under master Helio Gracie to achieve the red belt, represented the Gracie Academy in many challenges and taught jiu-jitsu in São Paulo State for more than three decades. 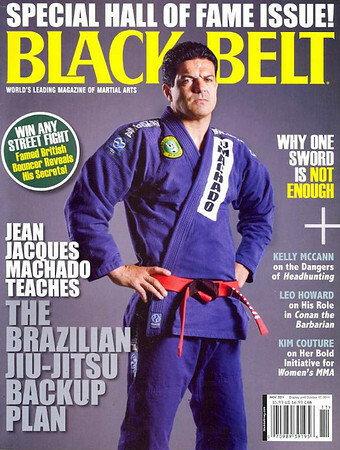 Joao Alberto Barreto – A Grand Master and one of the most important figures in the BJJ community. A red belt under Helio Gracie, he is famed for his unbeaten competitive record in the 1950s. He is the brother of GM Alvaro Barreto and GM Sergio Barreto. Alvaro Barreto – Grand Master Alvaro Barreto is a Brazilian jiu jitsu red belt (9th degree) and one of the most important men in BJJ, being also the brother of GM João Alberto Barreto and GM Sergio Barreto. Flavio Behring – head coach of Behring Jiu-Jitsu Association, Flavio teaches seminars over the world and hold affiliated academies in Europe. Carlson Gracie – Son of Carlos Gracie, trainer of UFC fighters, with a very successful professional fight career. Carley Gracie – Son of Carlos Gracie and former Jiu-Jitsu and Vale Tudo Champion. Oswaldo Fadda – Perhaps the only individual coming from a non-Gracie lineage to earn a red belt, the Fadda academy was instrumental in bringing Brazilian jiu-jitsu to the poorer areas of Brazil. Pedro Valente Sr. – A famous plastic surgeon and close friend of Hélio Gracie since 1953. In younger years took up arms to defend the former governor of the state of Rio, Leonel Brizola. Wilson Mattos – Perhaps the oldest student of Oswaldo Fadda. Luis Carlos Guedes de Castro – Another black belt under Oswaldo Fadda. Francisco Mansor – One of only six people to be granted a professor’s diploma by Hélio Gracie. Founder of Kioto Academy. Rorion Gracie – One of the founders of the UFC who was instrumental in bringing No-Holds Barred Fighting to North America. Osvaldo Alves – Studied under Carlos Gracie and is the current IBJJF Technical Director and also a 2-time Pan-American Judo champion. Relson Gracie – Son of Helio Gracie and Brazilian national champion for an unprecedented 22 years. Founder of Relson Gracie gyms. Carlos Antonio Rosado – Carlson Gracie Sr. only red belt student; the highest ranking member of Carlson Gracie’s academy. Renato Paquet – A grandmaster who had a judo black belt and two boxing titles in addition to his red belt. Francisco Sá (Sazinho) – Known for his morals and honor in martial arts and in particular our Jiu-Jitsu, he died in 2013 at age 77. Robson Gracie (also known as Carlos Robson Gracie) – President of the Jiu-Jitsu Federation of Rio de Janeiro. Carlos Gracie – (Brazil, 1902–94) was taught judo by Otávio Mitsuyo Maeda, a Japanese emigrant to Brazil who was then a 4th dan Kodokan judoka. Carlos then passed the teachings on to his brothers Oswaldo, Gastão Jr., Jorge, and Hélio. In 1925, the brothers opened their first academy in Brazil, marking the beginning of Brazilian jiu-jitsu. Hélio Gracie – (Brazil, 1913–2009) was a Brazilian martial artist who, together with his brother Carlos Gracie, founded the martial art of Gracie jiu-jitsu, known internationally as Brazilian jiu-jitsu (BJJ). Until his death, Gracie was the only living 10th degree master of that system, and is widely considered as one of the first sports heroes in Brazilian history. This term describes a person who has standards and values of training, developing and improving his martial arts personally, psychologically, spiritually, mentally and physically. The students that keep training and learn from mistakes are the best ones. The students that train while they are winning, and break or claim they are tired when they are losing are not just a horrible work ethic; it is a horrible ethic that is simply an indication of the person in life. Work ethic derives from our responsibilities, actions, attitudes, and patterns. This term is the one every student should have. If you are superior to a student, you can still develop your skills. If you cannot respect a student, you really don’t respect yourself, or your actions. Like work, like relationships and life, it is a daily reminder and daily practice. These actions are always in and outside of class at all times. This one is also vital. The loyalty issue is something you either have, or you will never have. And blind loyalty is not the answer either. If you have an instructor that aids you, or mentors you, cherish that relationship and never lose it. I have known my instructor Carlos Machado for almost 17 years. I always give him props, and remind everyone where I came from. Never shame yourself to your instructor. Never shame or embarrass your instructor with your words or actions. And never try to use your instructor. I have heard tales of this all around the USA in BJJ. I personally know of a story of a martial arts instructor first hand that trained his students, and in the end they attempted to recruit his students for their own break off schools. When I first heard this firsthand, I couldn’t believe it. And I have heard it many, many times. I myself have had similar experiences. Many fighters or practitioners can be tempted by vanity and arrogance. In our Jiu-jitsu community, there are many dark sides that are based on selfishness, prejudice, insecurities, arrogance, anger, and lack of morality, immaturity and lack of respect. These sins of the martial arts are to be discarded and constantly reminded to avoid. The opposite and good sides to adhere to are selflessness, acceptance, security within yourself accepting imperfections, public humility and temperance from anger, moral structure adhering to your martial arts responsibilities, emotional maturity, and respecting yourself first, and others while reminding yourself that in the public eye one venting of anger, name calling or threats will always be remembered. Those ghosts fall in the past, and always strive to be remembered or attached to an organization. Unfortunately those ghosts are confined to their own self convicted Hades in life. Betraying a fellow martial artist, an instructor, an organization or a creed are a sin in the martial arts and if forgiven, will reoccur. Selfishness is a disease that is incurable, as there is always an ulterior motive that stays with the person. Be open and truthful, and never betray your teammates, school, instructor, lineage, your roots, and always remember you have a duty and obligation as a martial artist, and a piece of a lineage that will either stop with you, or root for the next generation. Keep your word and truth always. The willingness to stand up for truth and justice is a traditional virtue in martial arts. The courage spoken of here is a higher kind of courage. It is the courage of self-sacrifice, of standing up for the truth, of mentoring and defending junior students as well as supporting them, regardless of what the odds are or what the cost may be. It is not the petty actions of proving one’s self-worth by engaging in meaningless rivalry, foolish stunts or the intimidation of others as well as shameful behavior that disgraces the essence of your community and the Martial arts. Courage is based upon the strength to walk away from a person you could physically destroy, as well as engaging in physical conflict to defend the weaker. To develop courage, one must have self worth, and value in his or her community. Without either, they are simply a nomad and will never tap into their potential. An inclination to perform kind, charitable acts. This code is a code to follow for a lifetime. Many aids, helps, suggestions, guidance as a mentor get discarded, unappreciated and very rarely are paid back by passing this to another. Benevolence is an act that although rarely is any type of gratitude, thanks, giving, appreciation given back, a person must always hold his creed. To give or aid those less fortunate or not as talented, is a wealth of reward, but for those who simply take, those are to be discarded and doors closed upon. Compassion is a virtue, and a drive that endears the martial artist with his own ideals, dreams, passions, and virtues and desires to better himself, his abilities, his mental focus, his skills, and more importantly his part in a chapter of a lineage that has a vital meaning to tomorrow’s students and history. Deeds, not words. Is your intent sincere, or ulterior motivated? Selfish desires to take from an instructor, student or academy are unforgivable sins. These sins do not come from the martial arts academy, but rather from the upbringing of the student’s personal life before he met his or her instructor. Sincerity is a desire to assure, and present oneself with a public display of the martial artist and their open, supportive desire. These two creeds are vital and a completion of the above codes. Loyalty is a value that if betrayed, does not come from the academy or lineage. This comes from the person that betrays his wife, her husband, their mother and fathers, their brothers and sisters, and most of all, they betray themselves their entire life. A relationship for years means nothing unless that loyalty is untainted. Devotion is the promise of support, loyalty, appreciation and desire to be a piece of a larger puzzle for the future. This code of Devotion comes from both instructors and students. Moral character is the spark to develop a martial artist to his full potential. Open, honest, and discipline in life to avoid corruption of finances, vanity, or evil. Pride must always be a shield to defend against vanity, but against arrogance as well. Actions, not an enemy’s definition or a rival from anther school, academy or community defines integrity. Those competitive remarks will never scratch the layer of integrity. Respect and gratitude toward others has a strong effect on personal relationships, both at work or at school, and with friends and family. In community, respect develops your own inner spirit, your own ethical behavior and sets an example for those in the future. Others needs, and pains are acknowledged by your respect, as well as sincere concern for those less fortunate. Respect is also to be given to those who show it. For those who are not respectful, this is simply a mirror image of their own self-respect. If one cannot show respect daily, none other than himself or herself will unmask the mask of false respect. Respect those that are older, those that were great in the past and forgotten today, those that are younger and you must accelerate your patience to aid. Respect your community. Respect your values, and most of all, respect yourself. Respect senior ranks and their accomplishments. Respect your lineage, your origins and set a frame for those that will respect you in the future. * Standards for acknowledgement are the daily practice of Jiu-jitsu technically and physically, to not practice unethical actions such as bullying, alcoholism, illegal drugs, illegal actions, physical violence such as assaults or sexual assaults, internet stalking or cyberstalking, squatting on other academies or soliciting other school’s students. Actions such as these are deemed unethical, reject the points above on a practice of Martial arts, the standards originated by Grandmasters Carlos and later Helio Gracie, to Rolls Gracie, to modern day. If those requirements are not practiced, or an unethical student practices behavioral traits such as solicitation of a fellow association school’s students to self promote, profit in a business manner, cause interference with contracts or prospective contracts, tortious interference, internet defamation, violence, or other unethical standards usage of Vandry Brazilian Jiu-jitsu, William Vandry or all common copyright protection laws associated will not allow usage of those names withour expressed, legal permission. Any unethical student is not acknowledged as an instructor or if not current in current education of BJJ under VBJJA.